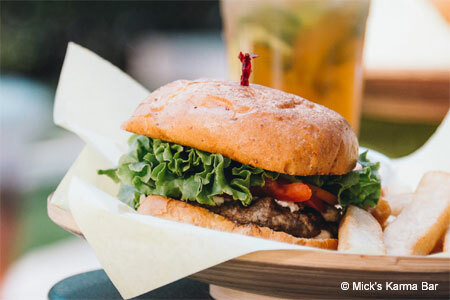 Innovative burgers and house-made drinks abound within the confines of an Irvine business park. : Mick's Karma Bar may be a little tough to find at first, as it's tucked inside a sprawling business park in Irvine, not too far from John Wayne Airport. Yet owner/executive chef Michael Schepers makes sure it’s a place worth discovering. The compact venue’s colorful chalkboard is filled with a wide array of composed burgers made with hand-ground patties, from the simple yet tasty Karma burger to Schepers’ progressive “burger of the week” concoction. Guests can wash it all down with a bevy of house-made drinks, highlighted by the popular strawberry-basil lemonade.